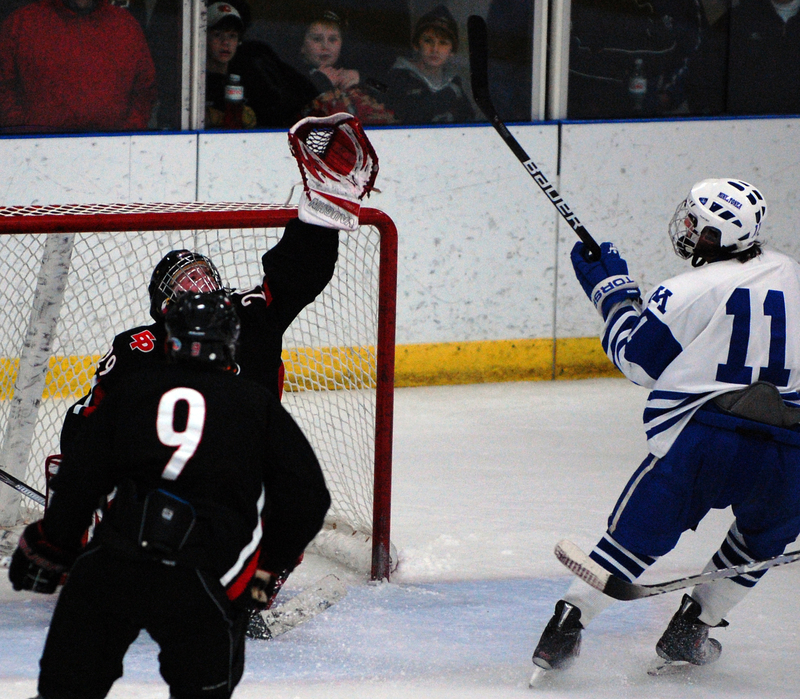 Minnetonka senior shuts out Eden Prairie to keep state's No. 1 team unbeaten. 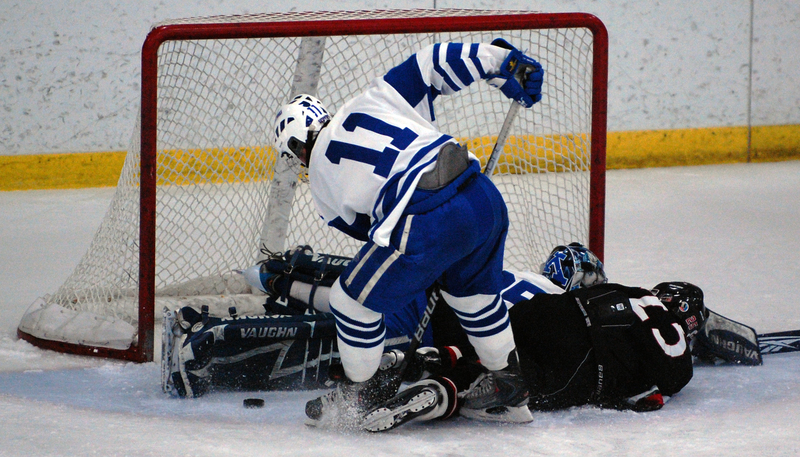 Saying that last part might have been the Minnetonka goaltender’s only misplay of the night. 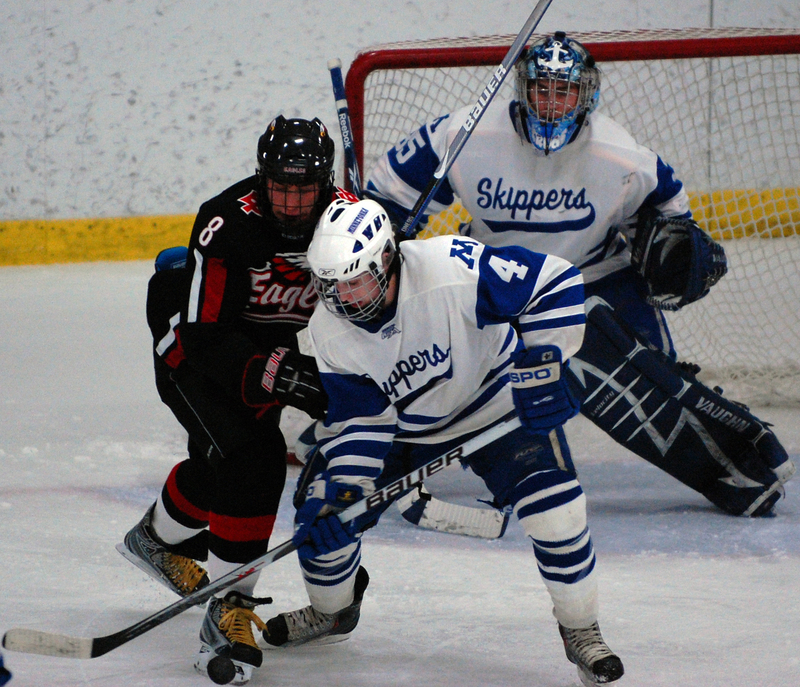 Kruger had the raucous Minnetonka student section chanting his name and Eden Prairie players cursing it by the end of the Skippers’ 1-0 victory in front of a packed Pagel Ice Center on Tuesday, Jan. 5. Despite what he might have you think, luck didn’t factor in Kruger’s performance. 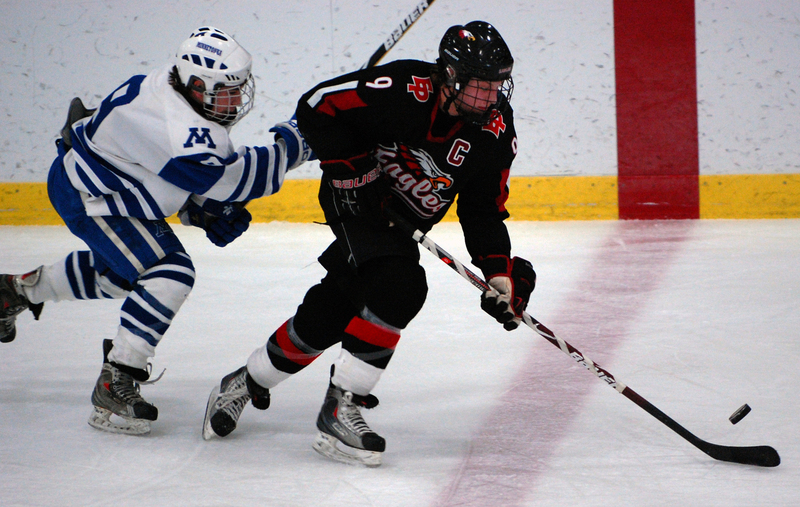 He continually frustrated Eden Prairie with perfect positioning, hair-trigger reflexes and his ability to devour loose pucks. 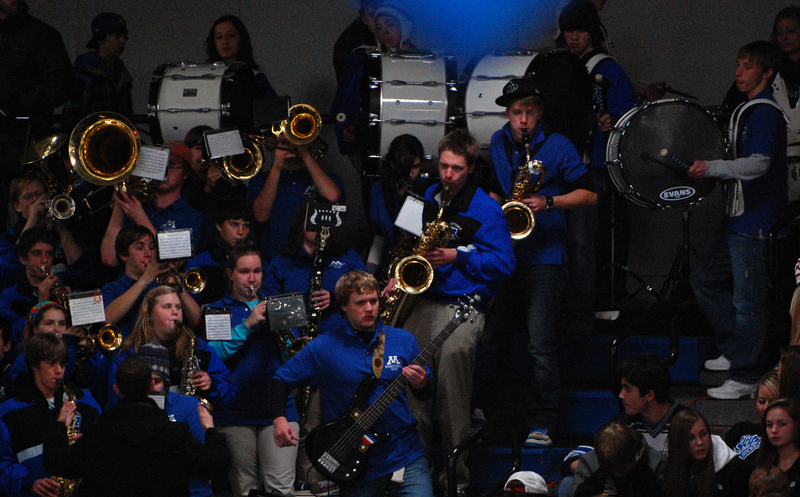 Although it was a midseason matchup between non-conference opponents, there was an electric, playoff-type atmosphere in an arena that has a listed capacity of 1,800 and was all but bursting from the crush of fans that had to be (psssst, don’t tell the Minnetonka Fire Marshall) numbering close to 2,000. 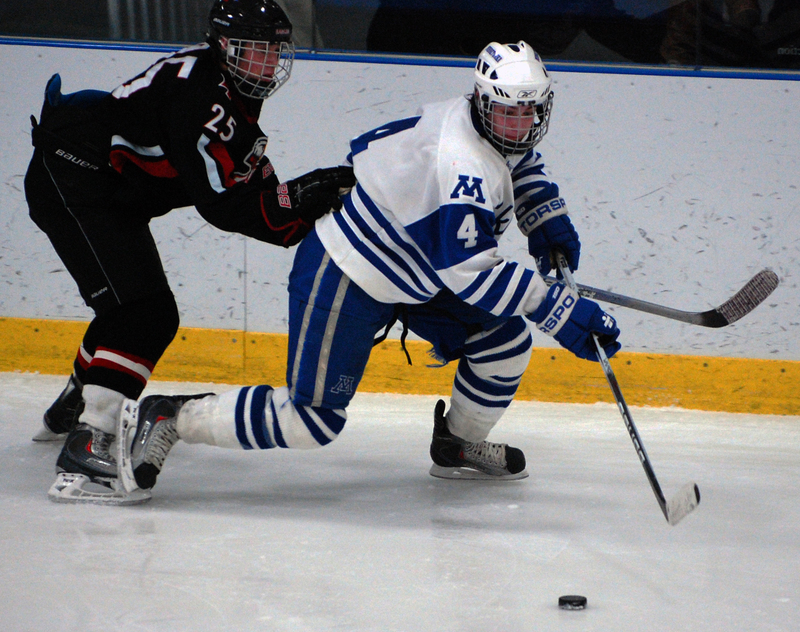 Minnetonka entered the matchup undefeated and ranked No. 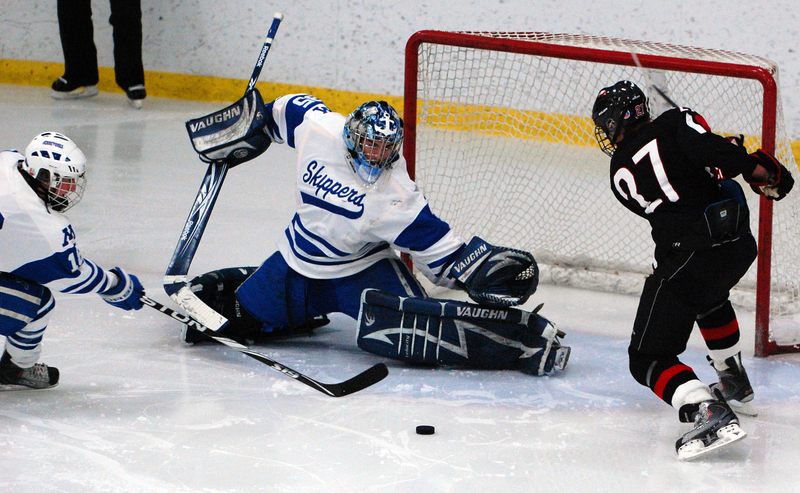 1 in Class AA while Eden Prairie, the defending state champion, had just one loss and was ranked No. 5. 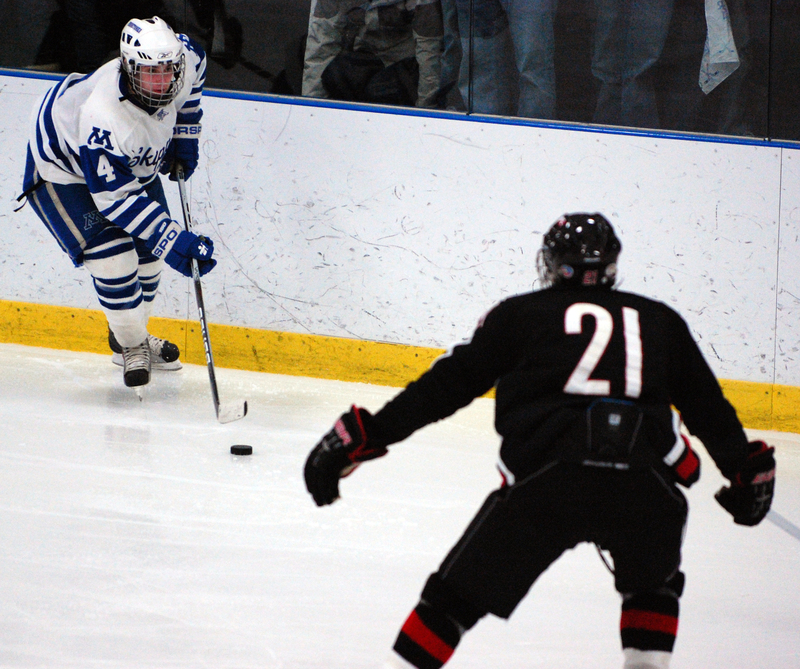 In what most certainly could be a preview to a Section 6AA semifinal or final, Minnetonka’s Tommy Lundquist scored on a deflection of an Andrew Prochno shot with 5 minutes left in the first period. 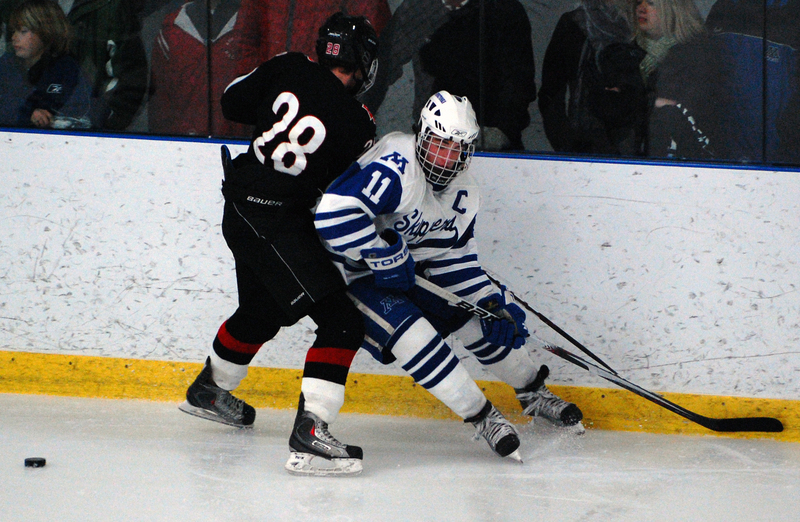 Kruger and his Eden Prairie counterpart, Andrew Ford, took over from there. 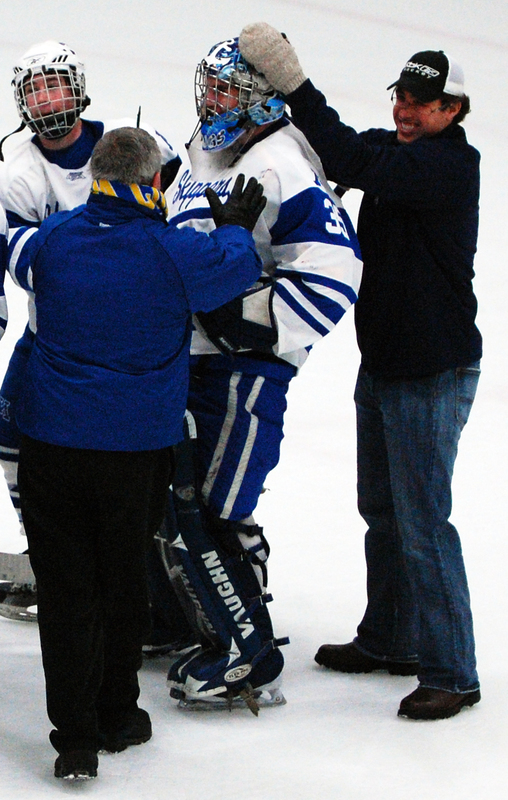 Kruger finished with 21 saves to earn his fourth shutout of the season and boost his save percentage to .938, the fifth-best in the state. 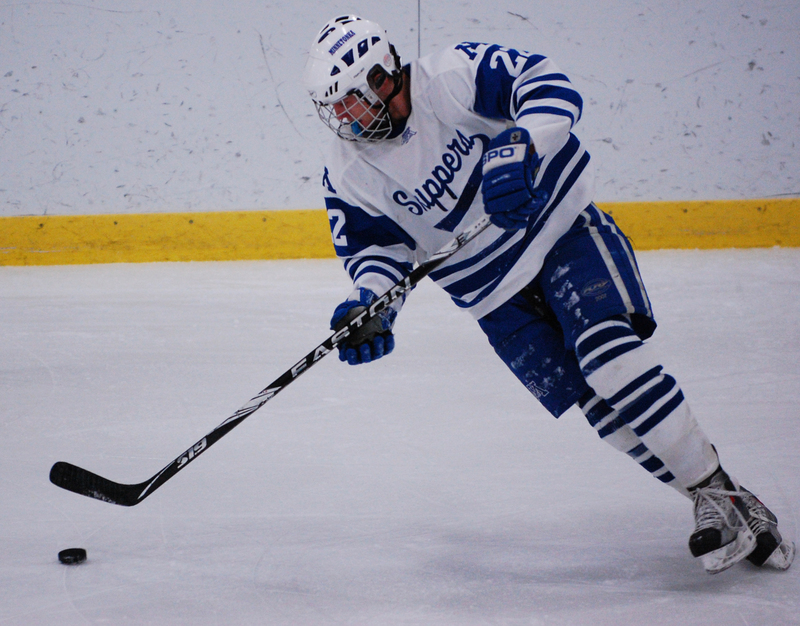 He said he was motivated to play well against an Eden Prairie (6-2-0) team that beat the Skippers (12-0-0) twice last season, including a 4-2 triumph in the Section 6AA championship at Mariucci Arena. 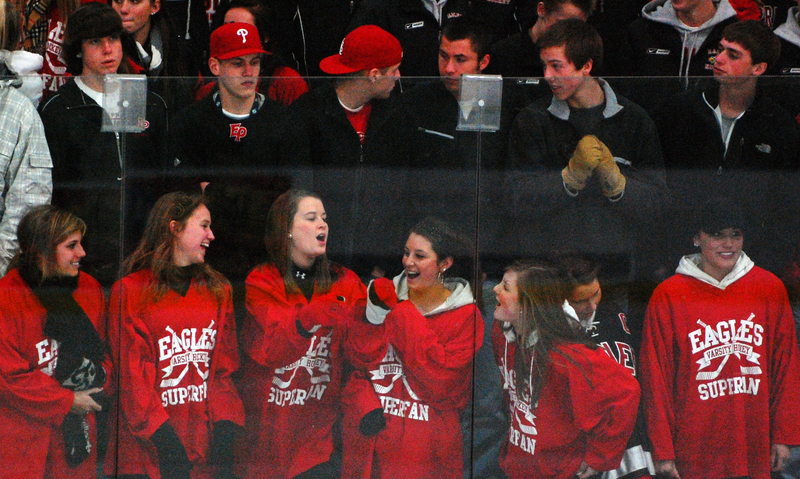 The Eagles went on to win their first state championship. 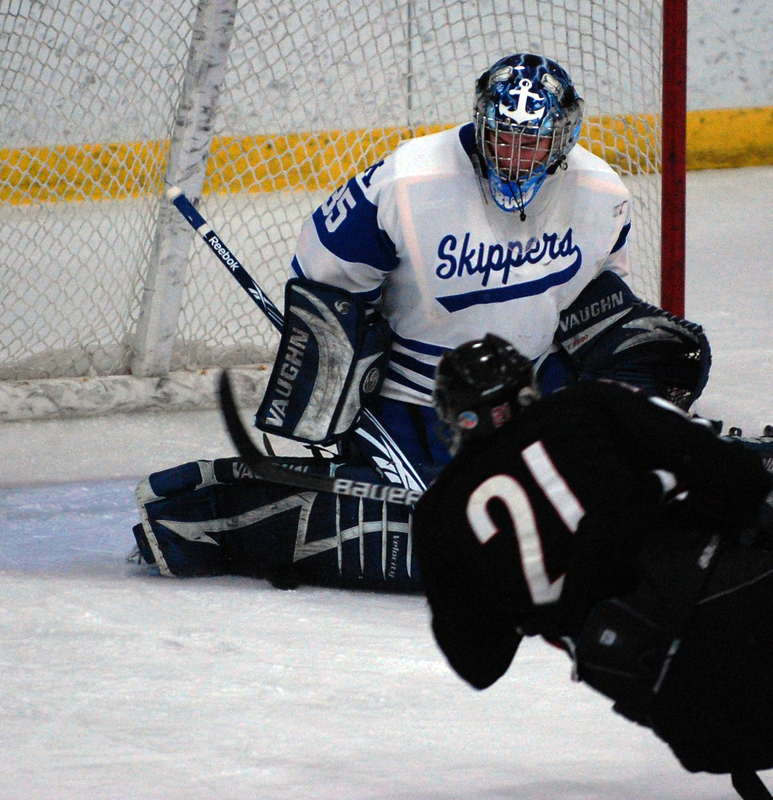 Kruger’s most spectacular save came in the second period, when he snared a close-range by Eden Prairie’s Mitch Rogge with his catching glove. 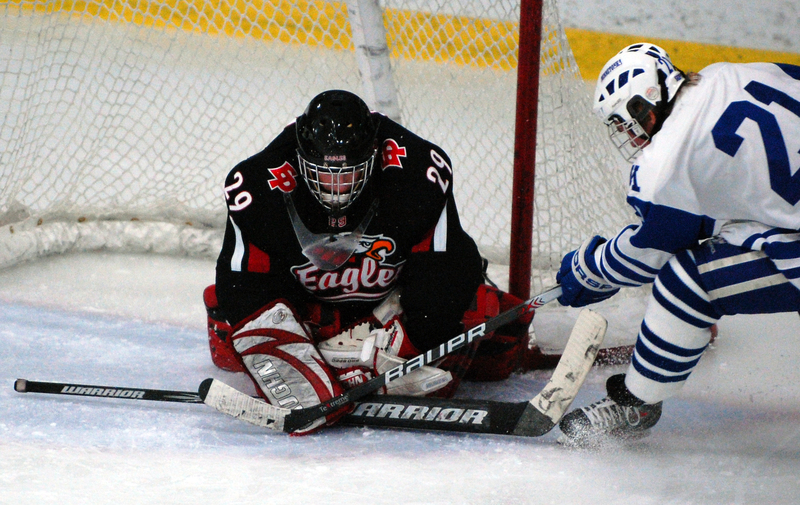 Kruger’s most timely save came late in the third period when, with the Eagles having pulled their goaltender in favor of an extra skater, he slid across the crease and got his left leg on a low shot by Eden Prairie’s Mike Erickson. 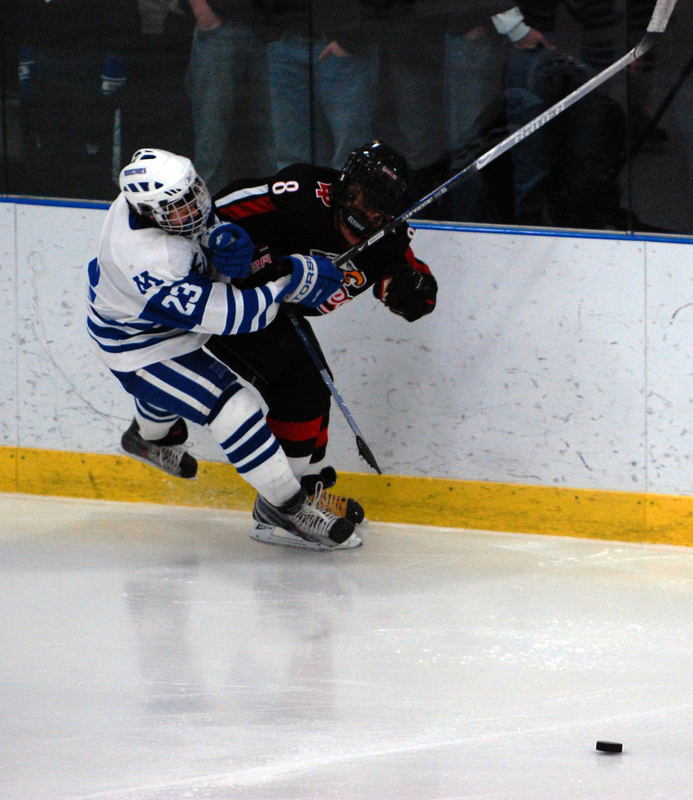 At the conclusion of that shift, Erickson repeatedly banged his stick on his facemask as he skated to the bench. 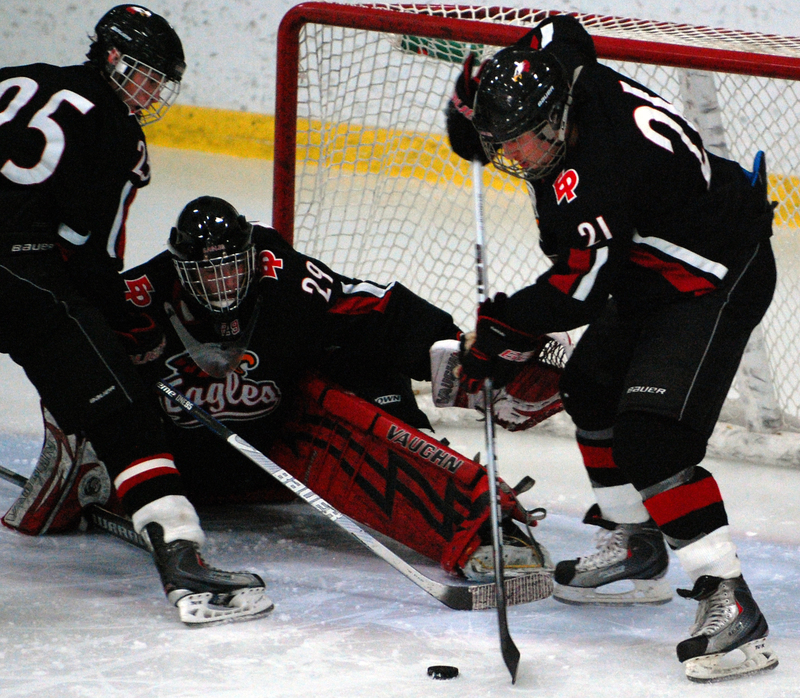 Eden Prairie’s top line of Rogge, Erickson and Rau generated the Eagles’ best scoring chances, but leading scorer Rau had an uncharacteristically quiet night. 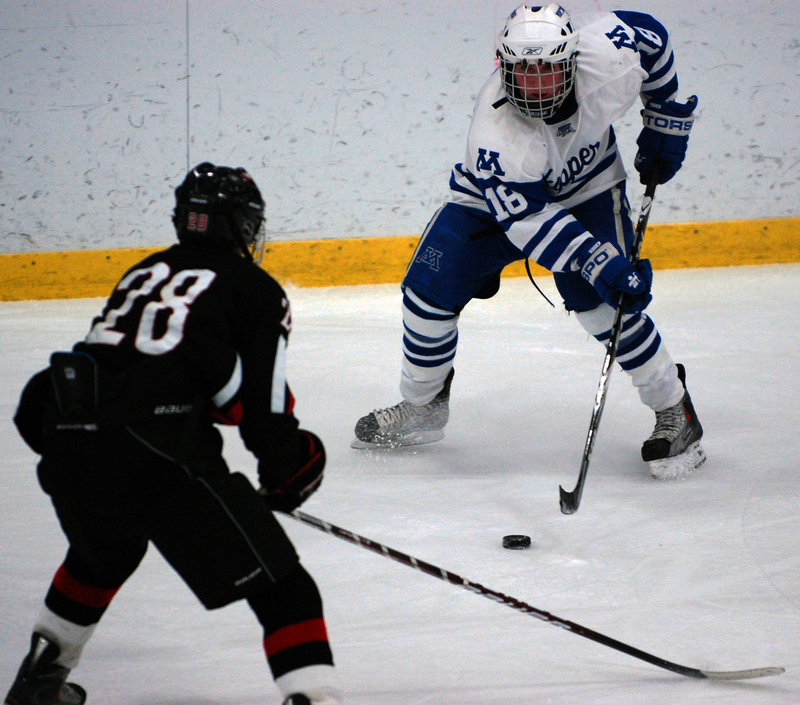 Matched up against Minnetonka junior center Thomas Schutt most of the game, Rau was held without a point for the first time in eight games. 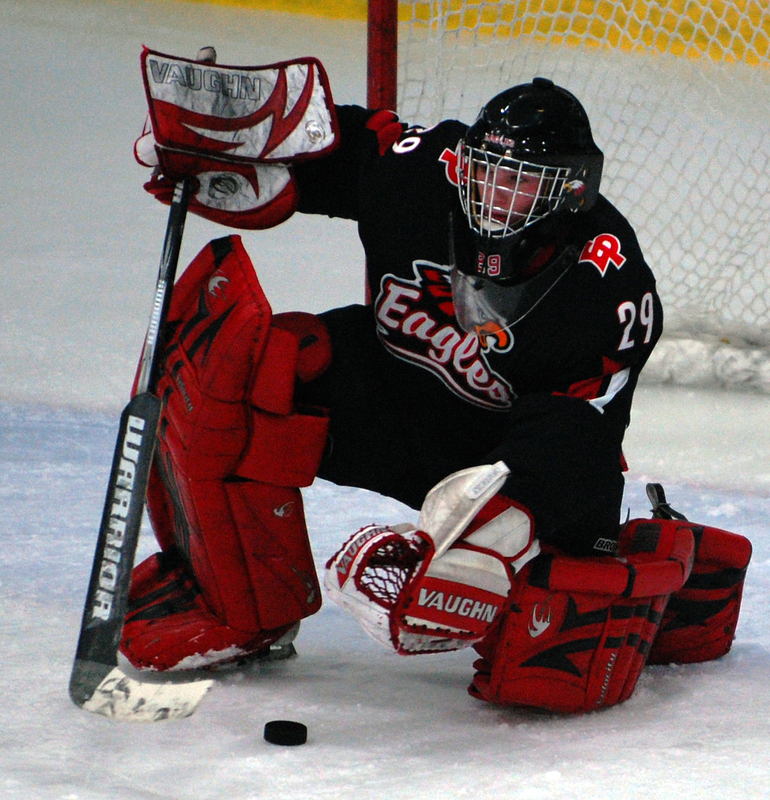 Senior goaltender excorcised a few demons of past meetings with Eden Prairie by shutting down the Eagles. 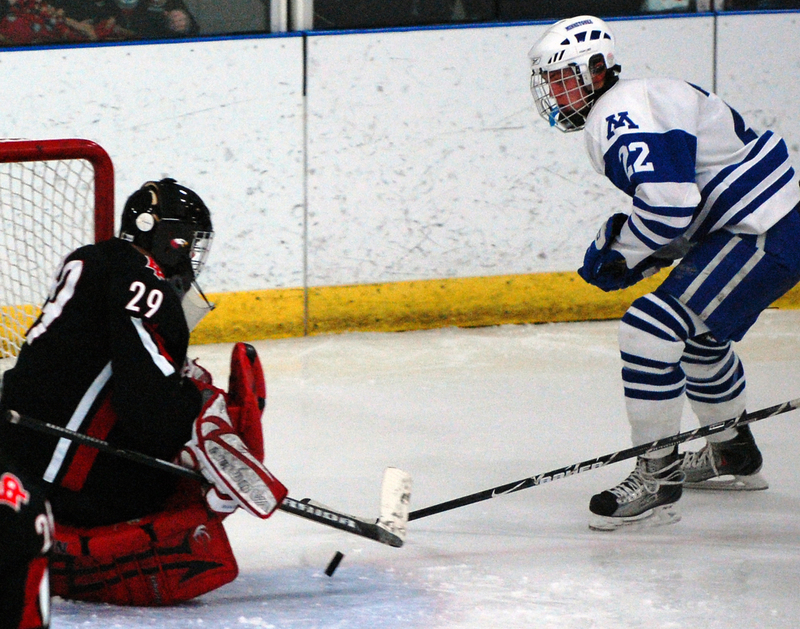 Was at his best in the closing minute of the third period when Eden Prairie had multiple close-range chances. 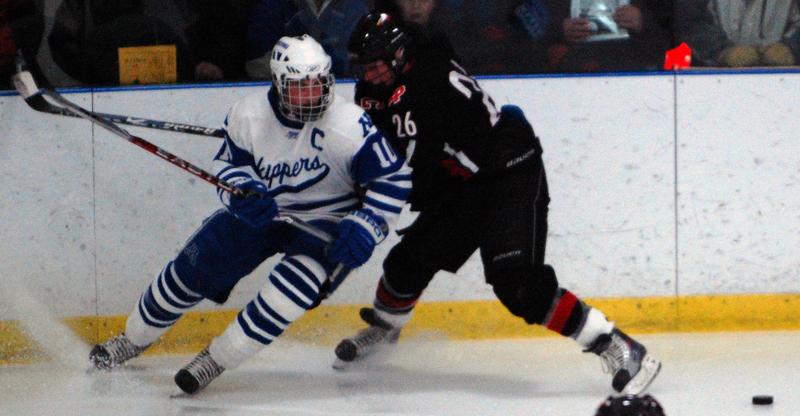 Junior forward wasn't involved in Skippers' lone goal but he did much of the dirty defensive work that allowed Minnetonka to keep Eden Prairie's high-powered top line, led by Kyle Rau, scoreless. 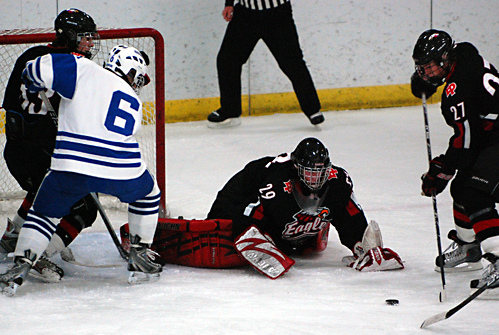 Junior goaltender couldn't be faulted for the one goal he did allow, a perfectly executed deflection in the slot. 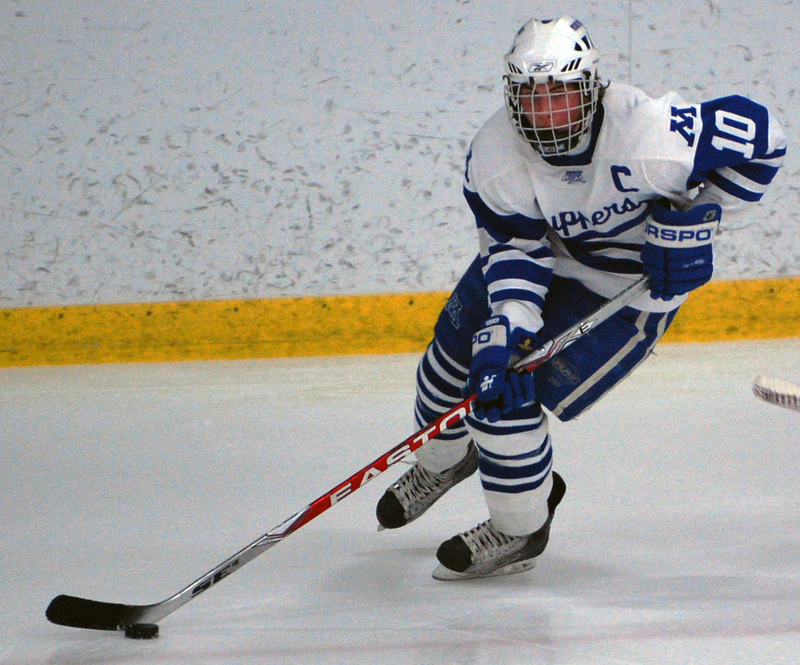 He was otherwise flawless against a Minnetonka offense that applied heavy pressure in the first period. 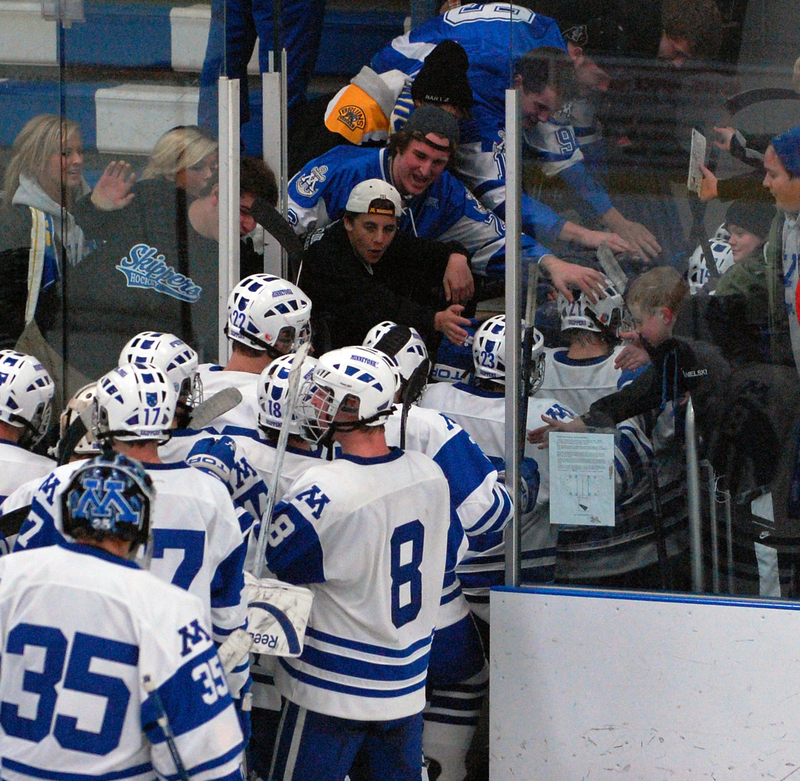 Fans were standing two and three rows deep along the upper rail at Minnetonka's Pagel Ice Arena, craning their necks and standing on their toes in an effort to get a glimpse of Tuesday night's game between the No. 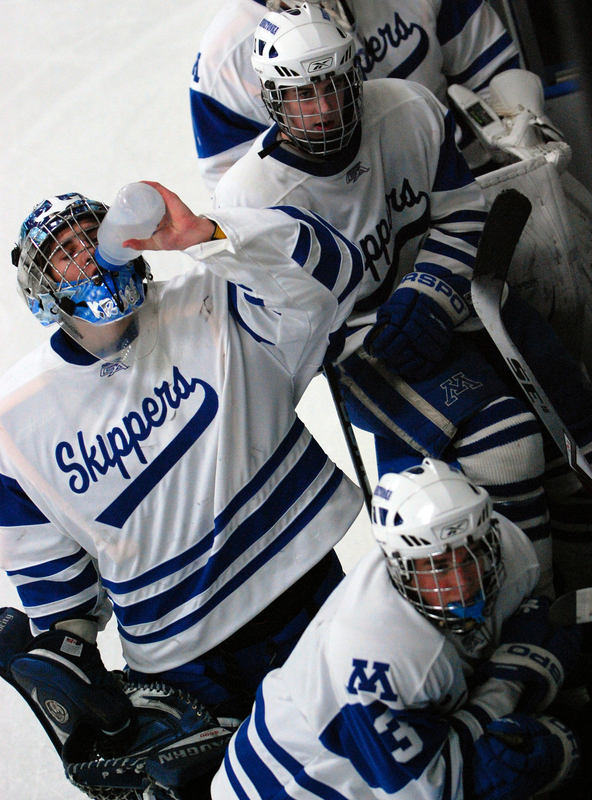 1-ranked Skippers and No. 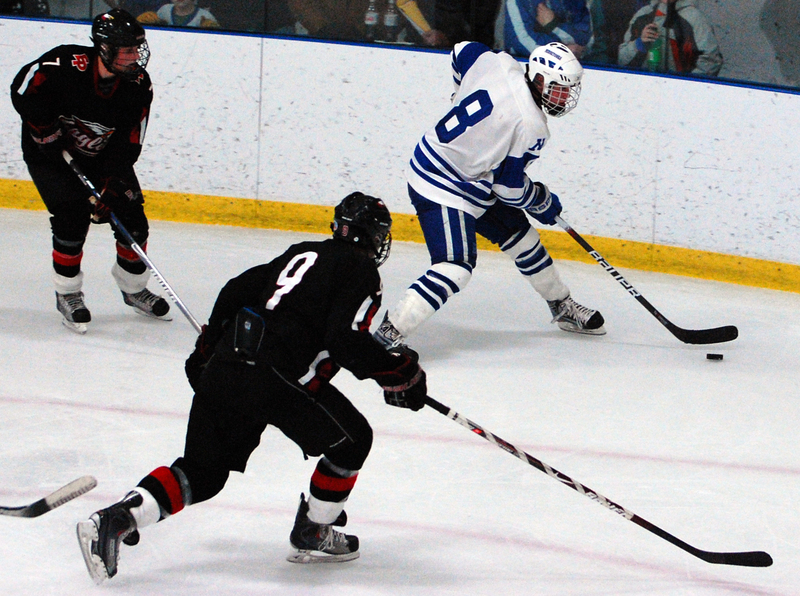 6 Eden Prairie. 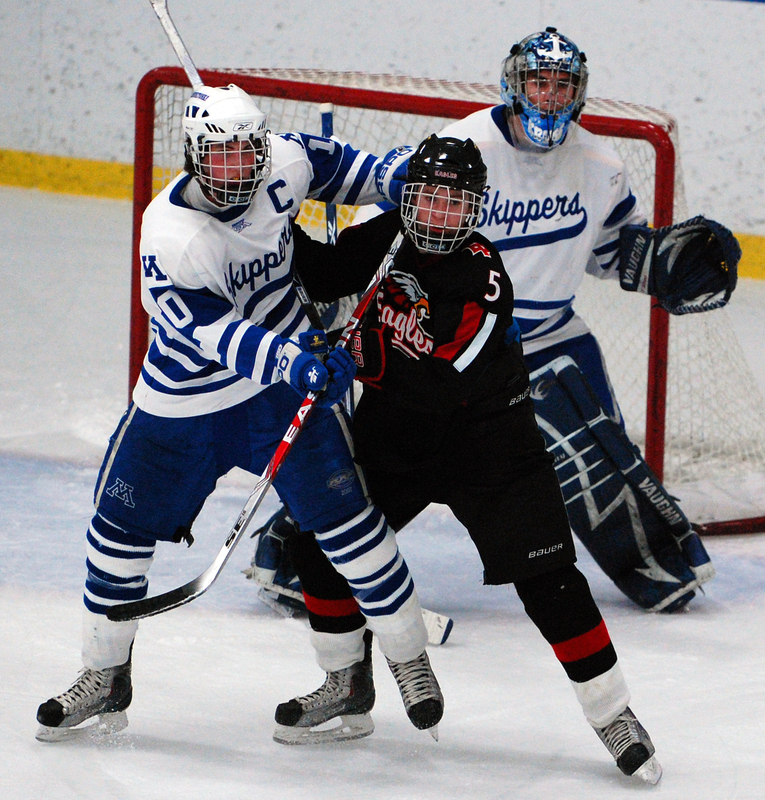 The crowd was much larger than the one that filled the arena for a big showdown earlier in the season at Minnetonka between the Skippers and No. 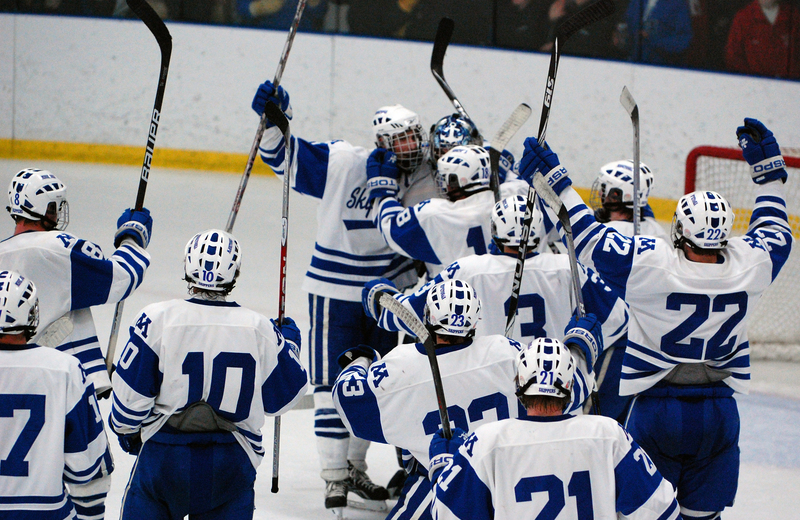 1 (Class A) St. Thomas Academy. 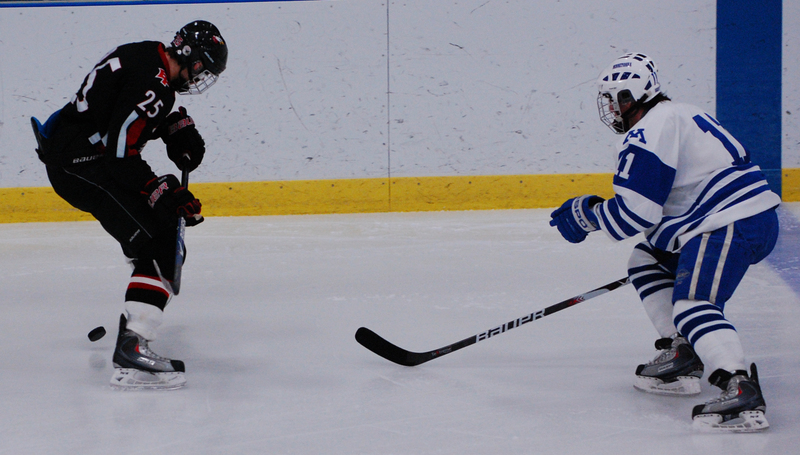 During the first-period intermission a lively game between Minnetonka mite teams kept the crowd entertained. 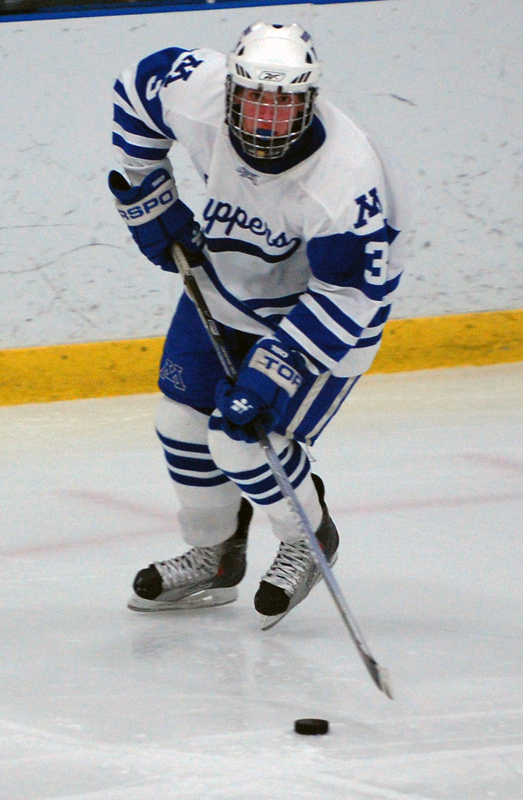 When a little Skipper with "Hanson" on the back of his jersey scored on a breakaway, Minnetonka's pep band saluted the effort with a few seconds of music. 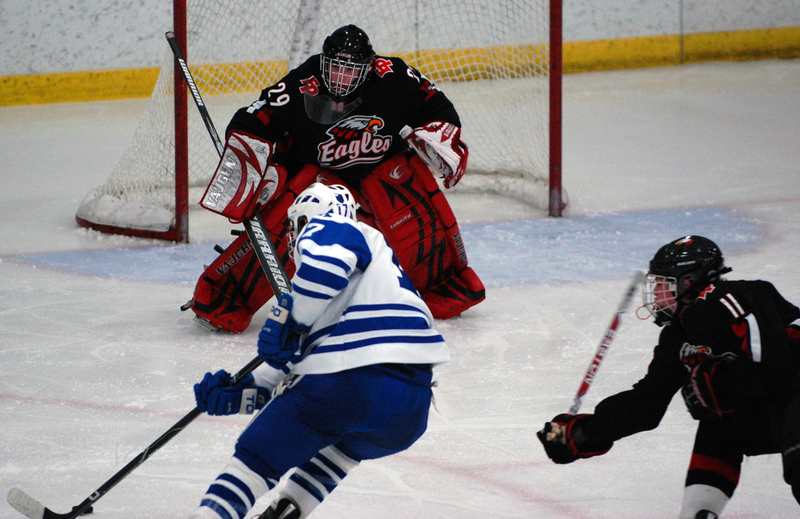 In a game filled with heavy hitting, the most punishing check came late in the third period when Minnetonka senior defenseman leveled Eden Prairie's Mike Erickson as he stickhandled through the slot during an Eagles power play. 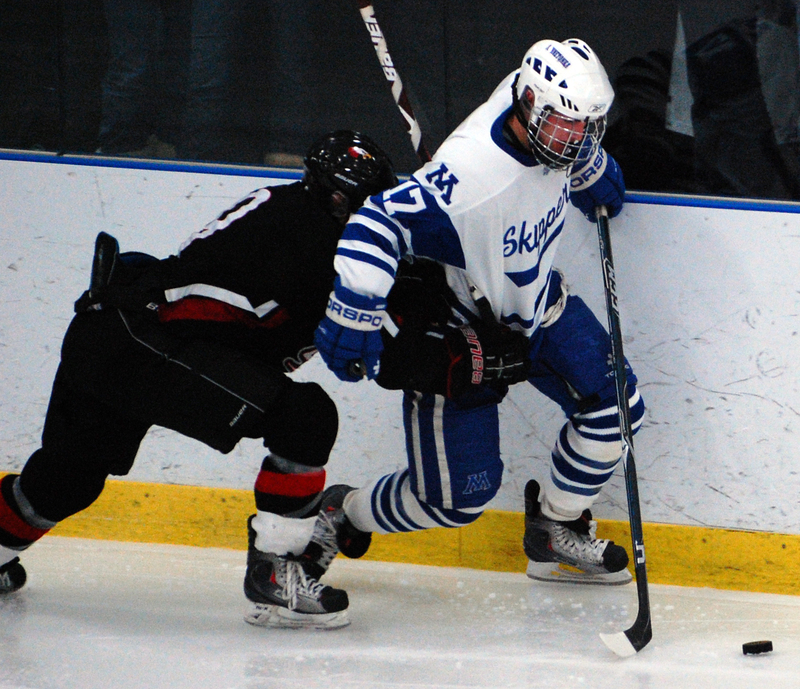 The force of the hit resulted in a loud thump and caused Erickson's stick to break in half. 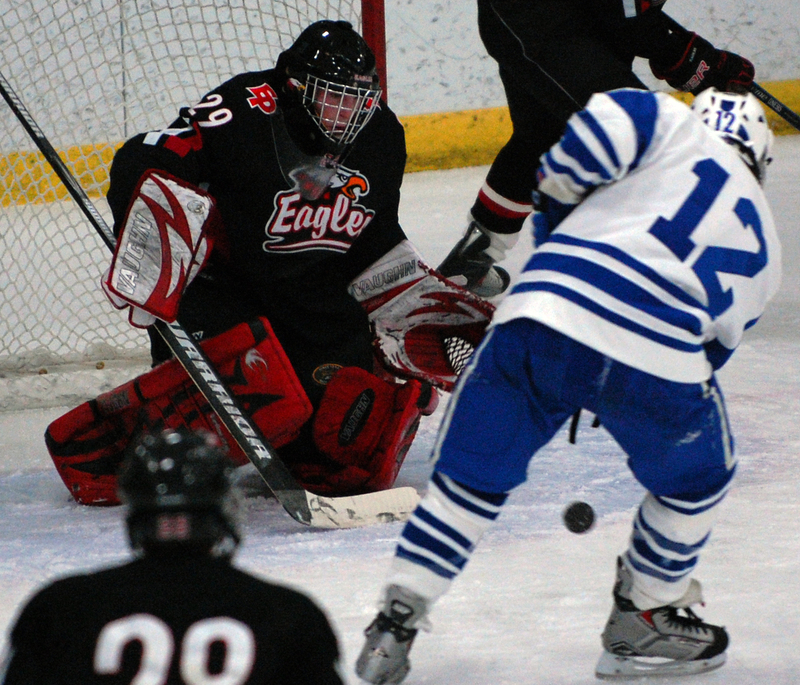 Minnetonka spent most of the first period cycling the puck in the Eden Prairie defensive zone behind Eagles goaltender Andrew Ford. 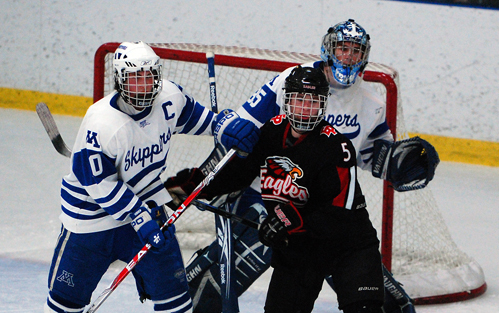 As a result, the Skippers finished the opening period with a 16-3 shots on goal advantage and numerous quality scoring chances. 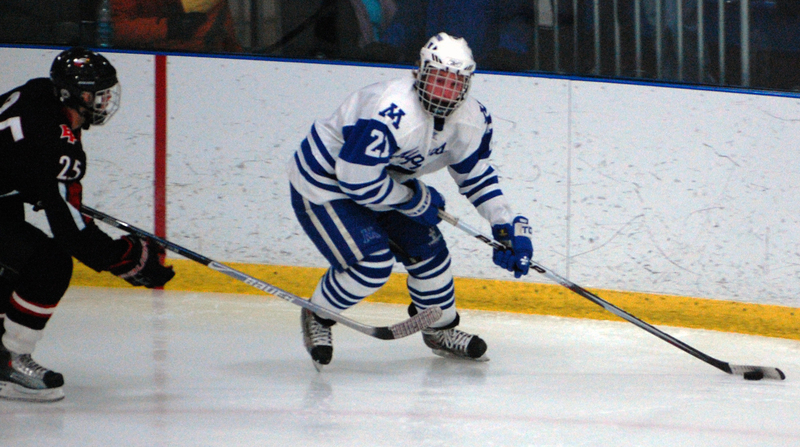 Freshman Max Coatta had one of the opportunities but couldn't convert a close-range shot. 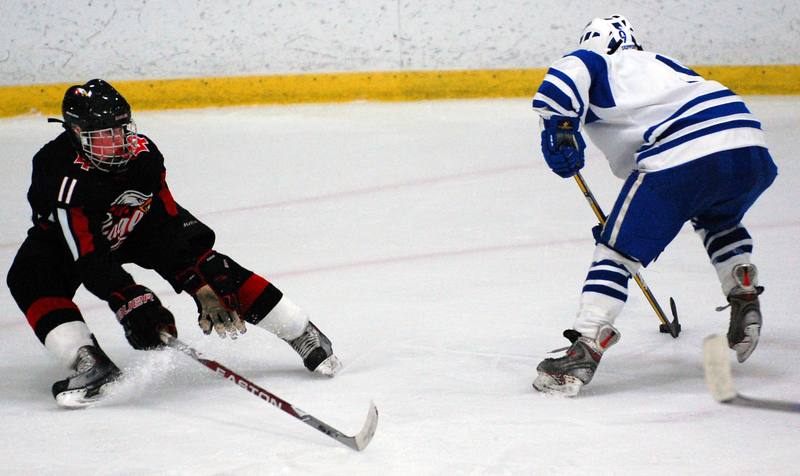 After a fast-paced first period, the game settled into a defensive battle in the second with few quality chances for either team. 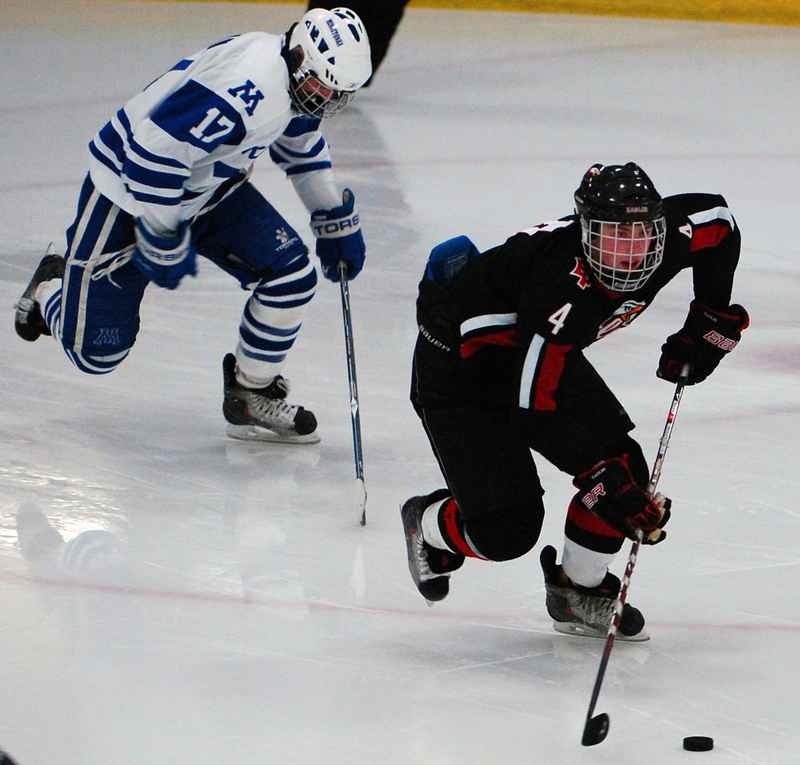 The best belonged to Eden Prairie's Mitch Rogge, who fired a shot off a 2-on-1 with linemate Mike Erickson early in the period. 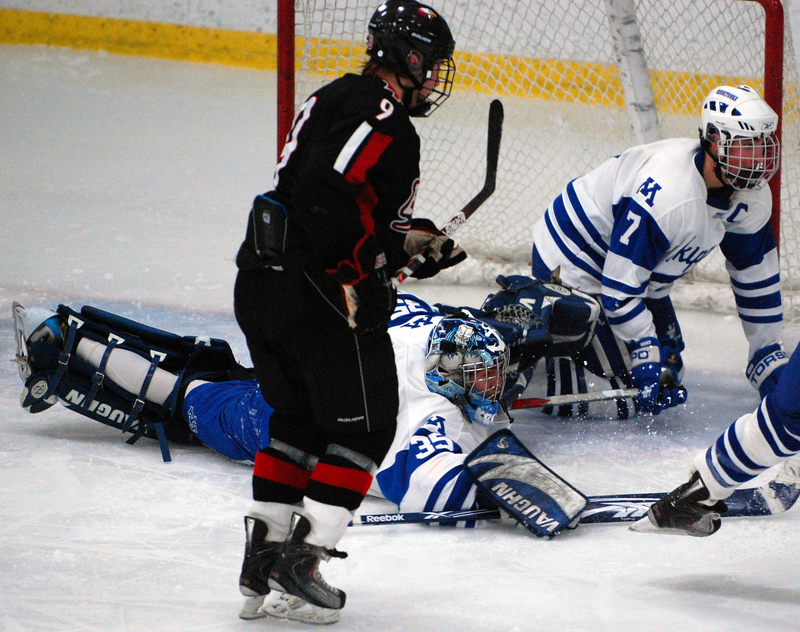 Minnetonka goaltender Jim Kruger slid across the crease and made a nice glove save on Rogge's shot, and chants of "JIMMMMMMY KRUUUUGER" rained down from the Minnetonka student section.